I have seen this middle reader-level book floating around for a few years but hadn’t picked it up until recently. I had thought that it was going to be some kind of fantasy novel. I made this judgment based on the fact that the author co-wrote the Spiderwick Chronicles with Holly Black. Now I know more about Holly Black, I think she is the one behind the fantastical elements of those books. So I was a little surprised when I began reading and it was readily apparent that I was reading more of a sci-fi/fantasy novel. That didn’t really put me off, however. It’s a fun and engaging read nonetheless. Eva Nine is twelve years old and has never seen the outside world, not to mention another human being. She has been raised and trained in an underground facility by a caretaker robot named, somewhat ridiculously, Muthr, which stands for Multi-utility task help robot. You can imagine, she also takes on a maternal persona. But one day, blasts from above alert them to someone-or something-is attacking and breaching the entrance. Eva Nine is forced to flee, finally putting all her training to use. Only, there’s a problem. She has been trained to survive on Earth and as far as all her fancy gadgets can tell her, nothing she encounters is Earthling. The trees are carnivorous, the birds have too many wings. Some thing are similar to Earth creatures, but on a vastly different scale. One of her first companions she meets appears to be what is known as a tardigrade, which is a microscopic water creature, but this one is enormous and communicates with her through psychic wavelengths. With her giant friend (she nicknames him “Otto”) and a fishlike humanoid named Rovander Kitt, Eva Nine and Muthr head overland to try and find out what happened to Earth, and to all the Earthlings. 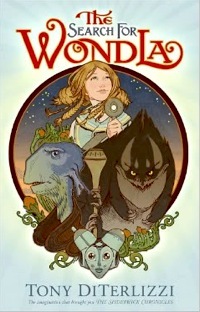 Filled with action, mystery, and a bright but stubborn heroine, The Search for Wondla is a great choice for older elementary age kids. And even better, there are two more books in the series!